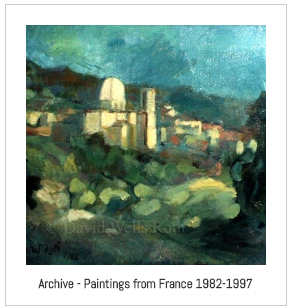 Please click on the images to see the paintings from each archive. 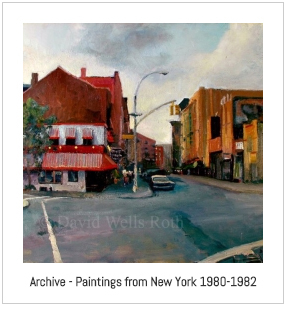 In May of 1980 right after college, Roth moved to New York City and painted cityscapes, views in Central Park and street scenes throughout the city and sold them to passersby off of his portable easel. In 1982, a French family offered Roth the opportunity to live in their home in the South of France for several months in exchange for a painting. He then moved to the Paris suburb of Le Pre St. Gervais and lived there through the mid '90s. While in Paris, he continued to paint city life, cafes and landscapes of Europe. Those paintings were shown in several solo exhibitions in France and the U.S. including the French Library of Boston, the Copley Society of Boston, and several group exhibitions including the Grand Palais of Paris. 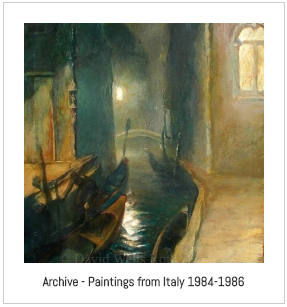 Between the years of 1984 - 1986, Roth took many trips to Italy painting landscapes in the Amalfi Coast, including Amalfi, Ravello, Capri as well as Tuscany, Venice and Rome. 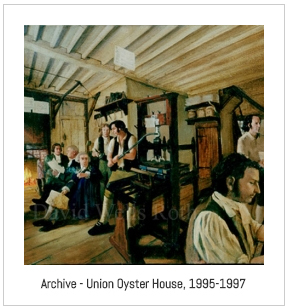 Between the years of 1995 - 1997, Roth commuted back and forth from Paris to Boston paint a series of paintings in Boston for the national historic site and America’s oldest restaurant, Ye Olde Union Oyster House. The commission includes a series of 9 paintings painted in the style and technique of the 1700's and 1800's, representing American and local history of Boston, and 32 illustrative panels fitted in the windows overlooking Boston’s Freedom Trail. Some of the window images were generated on computer and decoupaged to appear antiquated. The works depict the history of the American Revolution and feature such historical figures as Isaiah Thomas (printer and publisher and founder of The American Antiquarian Society in Worcester, MA), Count Rumford, Israel Bissell, Daniel Webster.